We in the UK should be rightly proud of Polecam and what it has achieved, with news that the 500th rig has been delivered. Extreme sports cameraman Steffan Hewitt designed the lightweight jib for his own use, as a tool to get the shots he wanted. He kept refining it as he used it. Others saw it and wanted it. There are now hundreds in use worldwide, all produced and still hand built in Kempston, Bedfordshire. Originally, camera choice was limited to small, lightweight SD cameras, then Toshiba and others produced HD versions and Polecams popularity rose. Steffan had pressure from top operators to enhance the product with a refined, more powerful pan & tilt system, and to allow the use of larger cameras. Now this is done. Until recently, the camera of choice was the Toshiba IK HD-1 minicam, but because of Polecams new capabilities, the field has opened up, allowing larger cameras. We spoke to some of the top owner operators to see what cameras they were using. I bought my first Polecam in 2008, and found myself in an explosion of 3D work, because of the ability to mount two HD minicams in tandem. They are great little cameras but I am always seeking new creative tools. The new capabilities led me to the Canon C300. From my point of view this is the best camera for Polecam now. The picture quality is just stunning, and I can take it off the rig and use it for interviews and extras. For the work I do its brilliant. If you do OBs, I think the best camera is the Toshiba HD minicam or the Camera Corps HD minizoom, because they are remotely controllable for colour matching. For single camera work Id suggest a DSLR camera or the Canon C300. If, like me you do both, the Toshiba HD works very well. Like most Polecam owners, he has taken advantage of the enhancements that Polecam have made available over time. My latest update was the new Narrow Head. Thats a fantastic addition. For the last 15 years my work has been solely Polecam. I hugely enjoy everything I do with it. In 2007 I become aware of Polecam. I was just stunned at what it could do. I invested and have been too busy to look back. I got into shooting medical procedures by chance. Since then, I have done countless surgeries for education, webcast and broadcast via satellite for medical conferences. Ive lost count of the number of procedures I have shot. I have the original head and its small size is perfect for this kind of work. In the OR today I use a Toshiba IK-HD1 with a C-mount zoom lens. Finally, an opinion from UK BAFTA nominated DOP and professional cameraman Julius Brighton. He owns a RED Epic camera and carried out a test shoot. I knew I had to be careful in choosing the lens, from a weight point of view. I chose a stills camera lens. The top stills lenses are every bit as sharp as the top cinema lenses, which have sophisticated mechanics for focus pulling, unrequired on Polecam. Generally you will set it up for a nice wide depth of field and away you go. I set the rig up and started looking at the shots. 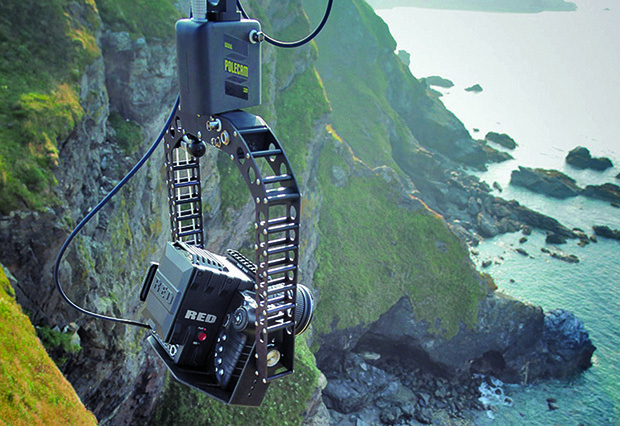 A RED Epic, hung out over a cliff, using 5 poles and the wire strut stabilizing system. It was quite a windy day, but it was stable. The shots it immediately gave me were terrific. Im surprised how quickly I adapted to it. Its very user friendly. I could clearly see what it could bring to my work. I was like a kid in a sweetshop. I need to talk to the directors and producers about scheduling it in. Knowing the guys I work with I can see that when they realise what they can achieve with it they will want it everywhere its a phenomenal bit of kit.